Can Obama’s health-insurance expansion recover from its shaky rollout? Despite a rocky start and Republicans’ continued efforts to repeal, defund or delay the Affordable Care Act, President Obama’s landmark health insurance law has triggered the nation’s largest expansion in health insurance coverage in 50 years. 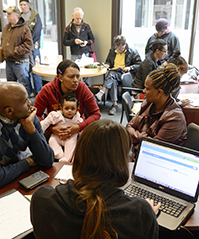 By the time the law’s March 31 sign-up deadline had passed, between 7.1 million and 9.5 million people had bought insurance under the program. It is unknown whether the law will eventually reduce medical costs, as supporters claim, and the act continues to face legal, political and ideological challenges. The GOP says the law imposes federal control over private medical decisions, and conservative religious employers have challenged the law — all the way to the Supreme Court — over its mandate that they cover employees’ contraceptives. Republican congressional candidates say they plan to use the law’s unpopularity among many GOP voters to rally strong turnout to defeat Democrats in the mid-term elections next fall.